Karnataka govt helpless to release additional water to Tamilnadu. The Karnataka government expressed its inability to release 3 tmcft of Cauvery water, sought by an official team from Tamil Nadu, to meet the water requirements of people in the Cauvery basin area. A delegation of officials from Tamil Nadu met officials in Karnataka and requested the government to share 3 tmcft of water on humanitarian grounds because of the prevailing drought. Reasoning given for not sharing of water. 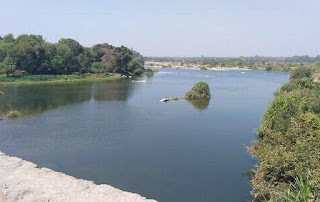 Karnataka govt official expressed the State’s inability to share water given the poor storage in the four reservoirs of the Cauvery basin because of drought on this side of the border as well. e-Waste now be Eco-Friendly says IISc reserchers. Indian Institute of Science (IISc) researchers have found a novel way to recycle the mounting pile of electronic waste more efficiently and in an environmentally friendly manner. According to the United National Environmental Programme, about 50 million tonnes of e-waste is generated annually across the world. The new approach is based on the idea of crushing e-waste into nanosize particles using a ball mill at very low temperature ranging from -50 to -150 degree C.
When crushed to nanosize particles for about 30 minutes, different classes of materials — metals, oxides and polymer — that go into the making of electronic items get physically reduced into their constituent phases, which can then be separated without using any chemicals. The use of low-temperature grinding eliminates noxious emission. The results of the study were published in the journal Materials Today. “The deformation behaviour at low temperature is very different from room temperature. There are two processes that happen when milling. The polymer material breaks but metals get welded, some sort of solid-state welding resulting in mixing; the welded metals again get broken during milling. At low temperature mixing does not happen,” says Prof. K. Chattopadhyay from the Materials Engineering Department at IISc and the corresponding author of the paper. There is also a lower limit to which materials can be broken into when e-waste is milled at room temperature. The maximum size reduction that can be achieved is about of 200 nanometre. But in the case of low temperature ball milling the size can be reduced to 20-150 nanometres. The low-temperature ball mill was designed by Dr. Tiwary. The cryo-mill grinding chamber is cooled using liquid nitrogen and a small hardened steel ball is used for grinding the material in a controlled inert atmosphere using argon gas. “The interface remains clean when broken in an inert atmosphere,” says Prof. Chattopadhyay. “One of the main purposes of ball milling [at room temperature] is to mix materials. But in the case of ball milling at low temperature we did not observe any mixing; the individual components separate out really well. We wanted to use this property more constructively. So we took two printed circuit boards from optical mouse and milled them for 30 minutes,” recalls Dr. Tiwary. The polymer becomes brittle when cooled to -120 degree C and ball milling easily breaks it into a fine power. Metals and oxides too get broken but are a bit bigger in size. The crushed powder was then mixed with water to separate the components into individual classes of materials using gravity. The powder separated into two layers — the polymer floats at the top due to lower density, while metals and oxides of similar size and different density settle at the bottom. The bottom layer when diluted further separated into oxides at the top and metals at the bottom. The oxides and metals were present as individual elements. Designing a cancel killer cell. Unlike normal cells in our body, cancer cells keep on dividing and proliferating without control, forming lumps called tumours. If we find methods to stop such unrestricted growth, we can treat and cure cancer. Anti-cancer drugs are still not specific enough and often damage normal, healthy cells as well, leading to unpleasant side-effects. This approach is, in effect, the use of one type of killer cells (microbes which cause disease to normal healthy cells, even death, if left untreated) to kill another type of killer cells (cancer). The trouble here is while they kill cancer cells, they may also damage healthy cells of the body; treating the body against such infection allows the cancer to come back. If only we find ways to ‘tame’ such microbes that they do not cause harm to normal cells, but specifically target cancer cells, we may have a winning strategy. While Covey could not do this, we now have ways to do so, thanks to the advances in genetic engineering, molecular and cell biology. The field of using bacterial cells, loaded with anti-cancer molecules, to fight cancer has grown fast in the last 20 years. The killer bacterium chosen by many researchers in the field is Salmonella typhimurium (the one that causes typhoid-like disease in rats, and leads to gastric problems and diarrhea in humans). The molecular biology of this pathogen (let us abbreviate its name as ST) is now well known, and genetically manipulating it is not difficult. A group of researchers at Yale University, Connecticut, USA, found that if we delete the gene called msbB from its genome, its toxicity towards normal cells is vastly reduced. However, although safe, the injection of this gene-deleted strain did not show substantial anti-tumour activity. The group soon realised that compared to normal cells, tumour cells are far richer in ATP, the energy currency molecule in cells. Given this, if one were to delete the gene called purL (which codes for making the ‘A’ part in ‘ATP’) from ST, the modified strain would need external addition of ATP in order to multiply and grow. And the abundant levels of ATP are the teaser. Thus the purl- deleted ST strain would make a beeline towards the tumour cells, ignoring normal healthy ones. We thus have a second way of herding ST towards cancers. What if we make a double mutant, that is, generate ST with both the msbB and purL genes deleted, grow and unleash it into the organ afflicted with cancer? This was indeed done about 15 years ago by a group of scientists from the pharmaceutical company called VION, near Yale University. This double mutant strain, termed V20009, was tried against mice with melanomas, and also on mice carrying human tumours grafted on to them. Intravenous injection of VNP20009 inhibited tumour growth anywhere between 57-95%. Plus, only live bacteria showed the anti-tumour effect, meaning that continuous infection by live bacteria is needed to eliminate tumours, and extracts or drugs with limited doses will not do. About the same time, a group from the National Cancer Institute, near Washington, DC, used VNP20009 to treat 24 human patients with secondary skin cancers and found it sufficiently safe for human use. Dr. Ravi Bellamkonda of Duke University, Durham, NC, USA went one step further, and decided to use VNP20009 as a carrier or vehicle, and loaded it with the protein called p53 which suppresses tumour growth, and another molecule called azurin which kills cancer cells, and also protects p53 from degradation. That such a twinning of p53 and azurin is useful was earlier shown by Dr. Ananda Chakrabarty of the University of Illinois College of medicine at Chicago. Dr. Bellamkonda injected this cargo-laden ST on to rats which carried grafts of cancerous brain tumours obtained from humans. This therapy allowed the cancer-bearing rats survive for more than 100 days, compared with barely 26 days for untreated rats. The beauty in using such cargo-laden double mutant pathogens is that (1) normal and healthy body cells are not affected, (2) they penetrate the body of the cancer cells, (3) this allows delivery of the drugs into the interior of the cancer cell (where conventional drugs find hard to enter), and (4) we can add more cargo, and allow additional cancer-killer drugs while keeping normal cells safe enough. A team of scientists from Raman Research Institute, Bengaluru, and University of Delhi have seen for the first time indications of a massive planet orbiting a low mass X-ray binary star system. The technique that has been used, namely, X-ray observations, is a new way of detecting exoplanets. The results have been published in Monthly Notices of the Royal Astronomical Society. The system is nearly 30,000 light years away and the planet is expected to be nearly 8,000 times as massive as the earth. The star system in question, MXB 1658-298 is an X-ray binary and a part of the constellation Ophiuchus (serpent bearer). X-ray binaries consist of a pair of stars orbiting each other of which one is compact one such as a black hole or a neutron star (in this case, a neutron star). The neutron star draws matter from its less-massive companion. The mass when drawn generates X-rays which are detected by detectors placed in satellites in space. Discovered in 1976, this binary star system is so far and so faint that it may be observed only when it shows “outbursts” of X-rays. That is, an increase in X-ray intensity by a factor of 100 or more. Recently this system showed an outburst. “This provided us with an excellent opportunity to try to trace the orbital evolution of this system,” Chetana Jain, Assistant Professor, Hansraj College, Delhi, who is the first author of the paper, says in an email. As the two stars revolve around each other, the less-massive companion star hides the compact star every-time it crosses the line of sight, in between the detector and the neutron star, giving rise to eclipses. In X-ray binaries, the time in-between eclipses of the source can increase, decrease and also shows abrupt changes. This system, MXB 1658-298, is special in that the time between the eclipses increases and decreases periodically. “The eclipse first [time] arrived about ten seconds earlier and after about a year, arrived about ten seconds later that what would be expected [if these was no other body disturbing the system]” says Biswajit Paul, Raman Research Institute, who led the research, in an email. The team was surprised by this unusual behavior. This periodic variation implied that there was a third body orbiting the system. “The long-term evolution of the mid-eclipse times indicated that this orbit is shrinking. Over and above this, we found periodic variation on shorter timescale,” says Dr Jain, summarising the results. “Till now, there are various indirect methods [of detecting exoplanets] such as transit photometry and microlensing,” says Dr Jain. This discovery is made with a new technique, by measuring periodic delays in X-ray eclipses. X-ray observations are done from space observatories such as NASA’s Chandra X-ray Observatory. “In this particular work, we have used data from XMM-Newton and archival data from RXTE (NASA) and some earlier published values of mid-eclipse times,” says Dr Paul, who has been studying this system for eight years.